Wow! New Jersey experienced some wild rollercoaster weather this winter – mild weather interspersed with freezing weather, and peppered with a few snow storms. Yet, our, feathered friends, who have evolved amazing adaptions for survival, didn’t seem to complain too much. 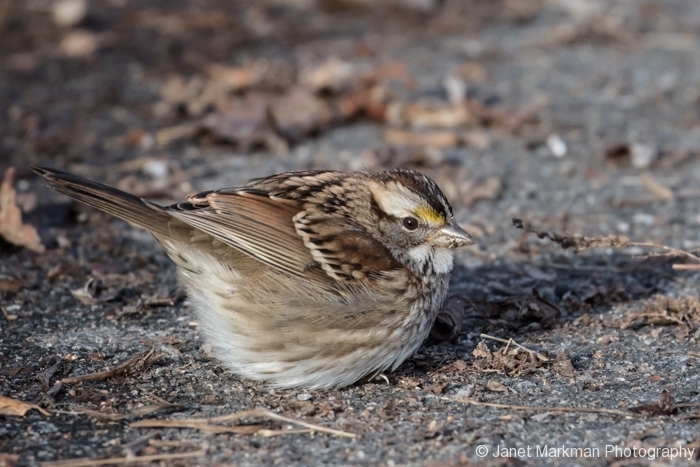 Have you ever noticed birds perched with their feathers all puffed up when it is cold? By fluffing up their feathers, birds trap air between their feathers and bodies, providing them with a natural layer of insulation. When birds sleep, they turn their heads back and tuck their beak under their feathers which allows them to breathe this warmer trapped air through the two holes in their upper beaks called nares. 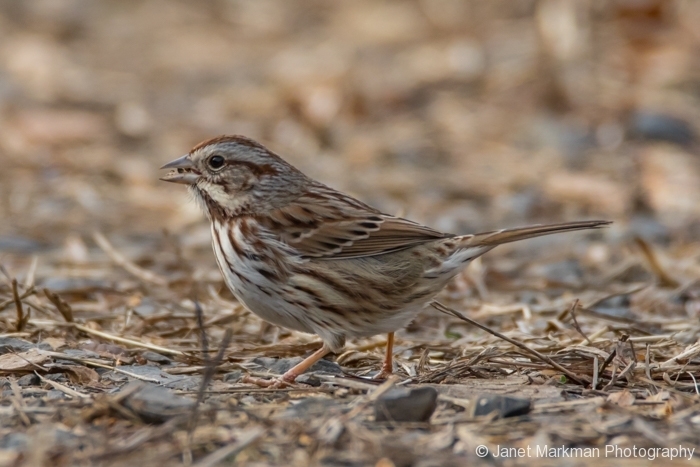 In the winter birds seek out communal roosting areas and crowd together to keep warm, especially at night. Birds also have an amazing ability to waterproof their feathers, utilizing an oil they secrete from a special gland situated near their rump, when they preen. As with all species, food is important for winter survival. Many birds, like squirrels, will cache their food, that is, safely storing food away for a period of time to be consumed at a later date. These avian food hoarders include birds we see during the winter months in New Jersey in our local parks or at our backyard feeders. These include Blue Jays, nuthatches, chickadees, titmice and even woodpeckers. While these birds feed primarily on insects during the warmer months, they will also eat berries, nuts and seeds which comprise their winter diet. During the winter, with the leaves off the trees, it’s a lot easier to observe these birds and their behaviors. . An amusing little bird to watch is the White-breasted Nuthatch (Sitta carolinensis ) who will take a seed, jam the seed into a crevice of a tree, and hammer it open with its sharp beak – a behavior referred to as “hatching”. I particularly love watching these small agile birds walk down a tree as they probe crevices looking for food and, when stashing their seeds, periodically stopping, arching their backs and looking around. 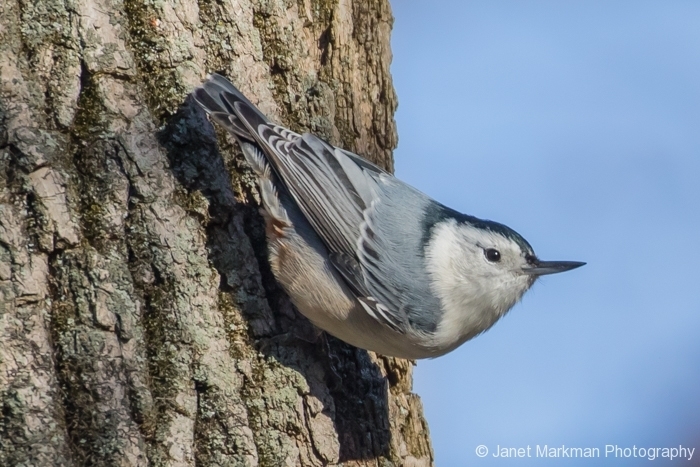 These White-breasted Nuthatches start high up in the trees and work their way down, unlike woodpeckers that begin their feeding near the base of a tree and working their way spiraling upward around it, probing the bark’s nooks crannies for food. 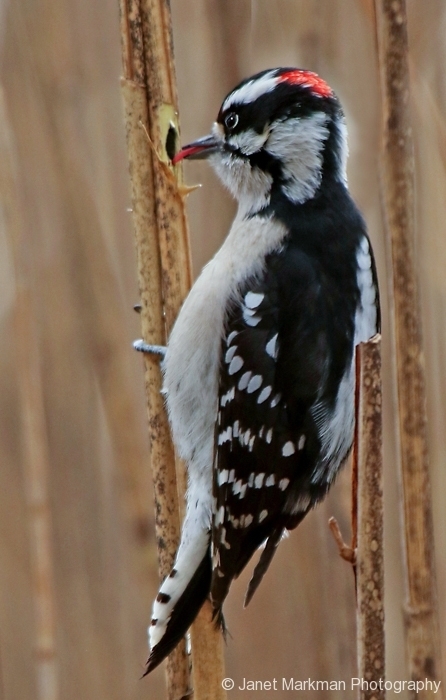 Smaller woodpeckers, such as the Downy Woodpecker (Picoides pubescens), will forage on marshy plants, such as Cattails and Phragmites, looking for hibernating insect larvae. The Black-capped Chickadee (Poecile atricapillus) and Tufted Titmouse (Baeolophus bicolor) will hold seeds with its feet and pound them open with their beak. I find these birds’ foraging habits extremely entertaining with their acrobatics and when they feed upside down. Blue Jays (Cyanocitta cristata) also hold seeds with their feet and pound them open with their beaks. Note that most winter birds usually feed during the morning hours and late afternoon and will frequent backyard bird feeders. On the other hand, birds like the dark-eyed Juncos (Junco hyemalis ), Northern Cardinals (Cardinalis cardinalis), Mourning Doves (Zenaida macroura) and various sparrows, will forage on the ground, feeding on seeds and insects throughout the day during the warmer months, and will also seek out feeders where seed is scattered on the ground.